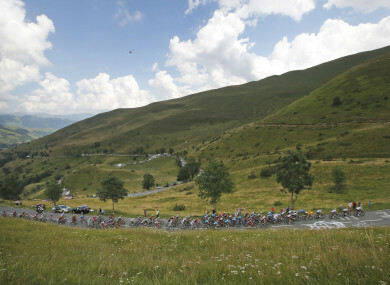 The pack climbs Col de Val Louron-Azet pass during the seventeenth stage of the Tour de France. BRITAIN’S GERAINT THOMAS moved a step closer to winning the Tour de France after pushing Sky teammate Chris Froome down the standings on a 17th stage won by Colombia’s Nairo Quintana on Wednesday. Ireland’s Dan Martin (UAE) finished second on the stage at 28secs behind Quintana, with Thomas third at 47 and Slovenian Primoz Roglic (Lotto-Jumbo) in fourth at 52. Froome’s failure to stay with Thomas in the final few kilometres of the 16 km climb to the finish of the Col du Portet amid a series of attacks by rivals means the Kenyan-born Briton is in danger of finishing off the podium. Dutch rival Tom Dumoulin, the 2017 Giro d’Italia champion, finished behind Thomas but well ahead of Froome to move up to second place. Welshman Thomas will start Thursday’s 18th stage, a mainly flat 171 km ride from Trie-sur-Blaise to Pau with a 1:59 lead on Sunweb team leader Dumoulin, with Froome in third. Friday’s stage is the final day in the mountains, but has a downhill finish in Laruns. The final podium placings will be decided by the penultimate-stage time trial, over 31 km, on Saturday. Email “Dan Martin takes second place as Geraint Thomas keeps Tour yellow”. Feedback on “Dan Martin takes second place as Geraint Thomas keeps Tour yellow”.